Is your business interested in reaching more potential customers? 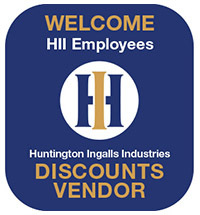 We invite you to join hundreds of local businesses currently offering discounts and special offers to HII employees through our employee discount program, HII Discounts. New to the program? Joining is easy, and free! Create an account here. Then submit your discount following the rules and regulations listed below. Once approved, we'll help our employees find you by adding your offer to the HII Discounts online search and mobile app. HII does not promote individual businesses. 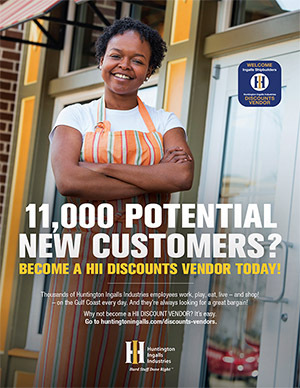 But, we'll send you a static window cling and provide you with an HII Discounts Vendor graphic to download and use in your promotions or social media. The discount must be available to all employees of Huntington Ingalls Industries, Inc. (HII) The company offering the discount must be a reputable business in the local area as determined within the sole discretion of HII. The discount must be specific for HII and not substantially similar to other discounts offered to the general public. The business offering the discount must be appropriate for the website, as determined within the sole discretion of HII. The discount must be ongoing and available for at least a year unless for seasonal or special events. The discount must be available via the web (i.e., HII will not act as a medium for receiving orders, or handing out tickets or coupons). HII is responsible for posting the discounts for a particular period of time on the discount website; however, no action is required by the Company and there will be no mass e-mails throughout the Company to market the posted discount. An employee badge can only be presented by the employee and cannot be taken/removed from his/her possession. The employee badge cannot be photocopied/faxed or reproduced for maintaining records on the individual. Examples of acceptable forms of verification are business cards and pay stubs. Disclaimer: Huntington Ingalls Industries, Inc. (HII) as the owner of this site, reserves the right to change these rules and regulations from time to time in its sole discretion. These rules and regulations, as currently in effect and as they may be from time to time amended, apply to all visits to this website, both now and in the future.